Junior forward Ruthy Hebard put the “super” into Sunday for the Oregon Ducks in a 102-43 thrashing of the Colorado Golden Buffaloes at Matthew Knight Arena. Without a win in Pac-12 play Colorado was little more than cannon fodder for the 4th-ranked Ducks. Every Oregon player logged close to 20 minutes of court time and each cracked the scoresheet in the wire-to-wire win. How bad was it for the visitors? 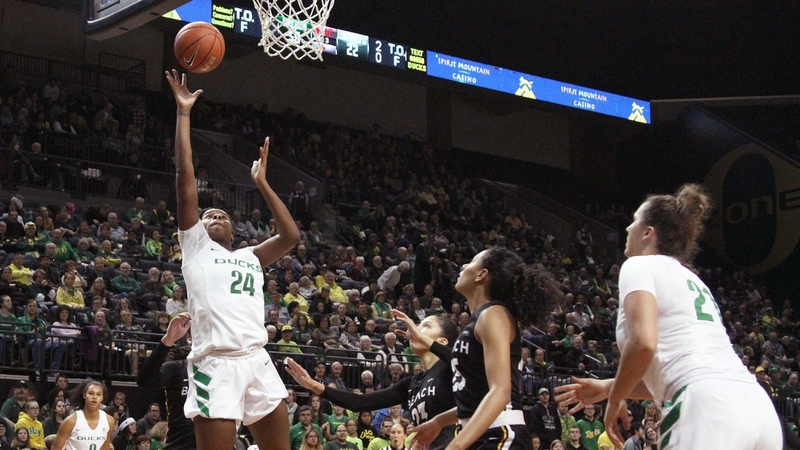 Oregon slapped a 27-2 lead on the scoreboard after one quarter and held Colorado to a pair of free throws until nearly two minutes into the second frame. Hebard led the Ducks in scoring with 24 points, a perfect 10 for 10 from the floor and four of five from the line. Her 12 rebounds were also a game high. Along with Hebard, Maite Cazorla (16 pts. ), Satou Sabally (15 pts) and Sabrina Ionescu (11 pts.) in double figures, the Ducks enjoyed a 27-5 advantage in points off the bench as head coach Kelly Graves made use of his full roster. For the game, the Ducks connected on 40 of 69 shot attempts for 58% while holding the Buffs to 16 of 63, 25.4%. Oregon out rebounded Colorado 44-35. The 59-point margin of victory is the largest in Oregon program history. Alone in first place and undefeated in Pac-12 play at 10-0 the Ducks now turn to the two teams closest to them in the standings and the most significant threat to an Oregon repeat as conference champions. After opening the Bay Area trip at Cal on Friday, February 8th (8:00 pm – Pac12 Networks) the Ducks square off against 8th-ranked Stanford on Sunday, February 10th (1:00 pm – ESPN2), followed with the home-and-home Civil War series with the 6th-ranked Oregon State Beavers beginning Friday, February 15th (6:00 pm – Pac12 Networks) at Matthew Knight Arena.